As reported earlier, Nippon Sharyo has been struggling to complete the contract for new FRA-compliant bi-level trains for California. The project was becoming a fiasco, years late and in danger of being canceled altogether. The Midwest bi-level passenger railcar procurement (Contract No. 75A0362) of 130 bi-level passenger railcars is led by the California Department of Transportation (Caltrans) in joint agreement with the Illinois Department of Transportation (IDOT), which represents the Midwest Coalition. In order to satisfy its obligations under the Contract, Sumitomo Corporation of America (SCOA), proposed to (1) substitute Siemens Industry, Inc. (Siemens) in place of Nippon Sharyo as SCOA’s prime subcontractor and railcar manufacturer, pursuant to Section SP7.2 of the Contract and (2) manufacture 130 single-level railcars in place of 130 bi-level railcars. Caltrans/IDOT are reviewing SCOA’s proposal. By moving from bi-level to single level railcars, Caltrans/IDOT will reduce the delivery frame for the railcars from approximately 24-34 months for a single level railcar as opposed to 5 years for a bi-level railcar. In order to proceed, Caltrans/IDOT and SCOA will execute an amendment to the Contract which will accommodate the substitution of Siemens as the manufacturer of 130 single level railcars. One complication is that the Siemens single-level cars are not low-floor vehicles, and California Amtrak routes have just 8″ platforms. So passengers will have to climb stairs to board, which can be difficult for those with limited mobility, heavy luggage, or bicycles. Bowing to local pressure, the Federal Railroad Administration has dropped plans for a controversial new rail line along the eastern Connecticut shore from its ambitious project to overhaul the railroad system in the Northeast corridor. [The] FRA dropped plans to add new tracks from New Haven to Providence, preferring instead to focus on increased maintenance and repair of the existing rail line and allowing Connecticut and Rhode Island to work with the FRA and other states, including Massachusetts, on a “capacity study” that could include alternatives to the existing route. This decision means that NYC-Boston travel times will probably never be made competitive. It should also be noted that political opposition came not so much from anti-rail Republicans, but from anti-rail Democrats — i.e. Connecticut Senator Blumenthal and Governor Malloy. In 2012, Nippon Sharyo won a contract to build new bilevel railcars for California and the midwest. The railcars were supposed to have gone into use by now, but the project (predictably for the usual reasons) has suffered major setbacks. Last year, the carbody prototypes failed FRA crash standards, forcing designers back to the drawing board. There have been reportedly hundreds of change orders. Nippon Sharyo is cutting its workforce by about 110 employees because of continued complications with a prototype rail car, the company announced Monday. The rail-car manufacturer has laid off nearly two-thirds of its workforce in the past 5 months: It dropped 100 of its 350 employees in January. The project is funded by $551 million in federal funds from the American Recovery and Reinvestment Act. If the company cannot deliver on the contract by Sept 30, the funds revert back to the US Treasury. The tight restrictions on when and where the stimulus money can be spent left Nippon Sharyo with almost no room for error with a car model that it hadn’t built before and a brand-new assembly plant 80 miles west of Chicago that cost $100 million. Crashworthiness of passenger railcars has been a primary focus of car designers since collisions involving commuter and freight trains in Southern California killed 11 people in 2005 and 25 people in 2008. Nippon Sharyo’s car hasn’t been able to pass a federally mandated test for absorbing rear- and front-end compression force generated in a crash. After repeated failures, engineers are now redesigning the car’s body shell. That and additional testing will take about two more years to complete, according to people familiar with the matter. The entire job was to be finished in 2018, with the stimulus-funded portion due for completion in 2017. Now, Nippon Sharyo isn’t expected to start production until 2018, people familiar with the work say. Five years after winning a $343 million contract to build 130 long-distance railcars for Amtrak, Spain’s Construcciones & Auxiliar de Ferrocarriles SA is struggling to complete the order. The work was supposed to be completed by early 2015, but as of late last year the company’s CAF USA Inc. subsidiary had turned out 70 baggage carsfrom its plant in Elmira Heights, N.Y. Nearly 400 defects were identified in the first 28 baggage cars delivered, according to an Amtrak report issued in February. The work schedule has been renegotiated, with each delay pushing delivery dates further. The FRA has just published its Notice of Proposed Rulemaking for a two-person crew requirement. The original motivation for the rule was to ensure the safety of crude-oil trains; however, the FRA intends to apply the rule to all train types, including passenger trains. The FRA apparently is unaware that train conductors have become an anachronism. Automation has eliminated the need for the second crewmember. These days, the conductor does nothing more than punch tickets. 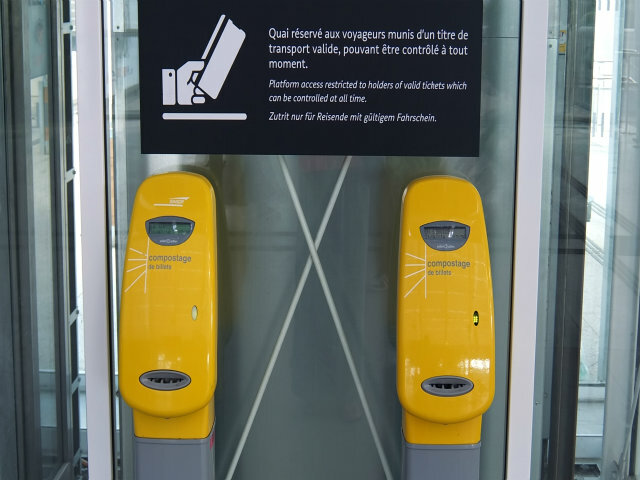 That task is much better handled by faregates, smartcards, or POP (proof-of-purchase) ticketing. Single-crew operation has an excellent safety record on non-FRA transit systems (such as BART, light-rail, etc). Since labor expenses make up a large portion of a transit system budget, the rule will have major impact on the budget for agencies like SMART and Caltrain (assuming they ever get their act together and eliminate the conductor position). Although the FRA suggests waivers might be possible, the rule will almost certainly reduce frequency of service. The FRA concedes that there is no data to justify the 2-person rule (even for dangerous freight cargo). Moreover, the report admits that international operations with 1-person crews have “acceptable” safety records. The only beneficiaries of the rule is the United Transportation Union, which would see increased employment as a result of the rule. On February 24th, a Metrolink train struck a pickup truck that was hauling an empty trailer. Normally such a collision would be no big deal. But in this instance, the train derailed spectacularly, with passenger cars strewn about. Dozens of passengers were injured and the train engineer was killed. In addition, the report stated that the cow-catcher had some poor welds and that other parts of the device “showed probable failure” despite extra brackets and good welding in other places. A photo attached to the report shows that the cow-catcher had broken off the cab car. Arrows point to four weld failures and areas where bolts were sheared off. According to the report, a metallurgist found that one of the two failed couplers displayed evidence of a manufacturing defect known as porosity — a casting flaw that causes voids and bubbles to form in the metal. Not to defend Hyundai, but the real problem isn’t poor quality control, but rather bad train design, and Buy-America trade-protectionism. There are any number of overseas manufacturers who could have sold Metrolink a service-proven trainset. But because Metrolink isn’t allowed to buy trains overseas, Hyundai had to create a whole new facility in the US, and set up a domestic parts stream. That is a complicated endeavor. And the trains themselves are of a custom design, largely dreamed up by government bureaucrats. It is no wonder the Metrolink train is defective. The most distressing part of this fiasco, though, is the failed coupler. Most newer regional/commuter trains don’t even have couplers, because the world has moved on to articulated trains. Articulated trains have many benefits — one of which is that they are much less prone to jackknifing in derailments. But US rail planners continue to oppose the use of articulated trains, for truly baffling reasons. When it comes to trainset procurement, the US is a bureaucratic and technological basketcase. Vendors have to navigate the byzantine Buy-America and FRA rules. You can get a sense of the dysfunction in the Questions-and-Answers submitted during the early stages of the bidding process for the new Acela rolling stock. As the FRA will place unique requirements on this equipment, it would be helpful to provide an understanding of how much change will be permitted to a “Service Proven” design before it is no longer considered to be the same design. Might a syntactic change be a way to get around this conundrum? Because of the special requirement and constraint of Amtrak operating conditions…and Tier III compliance, a lot of design changes will be necessitated from the “Service Proven” equipment. Physical appearance might be different from the existing “Service Proven “equipment. As such, the requirement of service proven or a variant thereof should be read as “developed with proven technologies”. Due to the (not yet fully known) impact of the (not yet published) FRA Tier III requirements…it is likely that axle loads of “proven” equipment will exceed 17 tonne. The TSI permits operation of 18 tonne axles at speeds to within less than 5 mph of the maximum specified by Amtrak; consideration should be given to allowing this slight increase in speed over the limit set by the TSI. The FRA denied that request, as well as two other requests to reduce the buff-strength requirement. There are components which are not available in the US at the moment. How can we state the price to be made in the US? Shall we include an investment cost, technology transfer cost including patent? This requirement does not seem realistic. So it would appear that the FRA learned nothing from the Acela-1 fiasco. The nonsensical design requirements will scare away bidders. With fewer bidders (plus the extreme cost of a full-custom trainset), the Acela-2 trains will probably be really expensive. Hopefully, Acela-2 won’t be as unreliable.